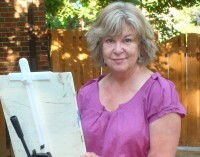 Carole loves color and line, something she shares with many artists. Her love of creating has been an active part of her life since her child hood. Following her passion she acquired as much art knowledge as possible. She has a BFA in intaglio printmaking, BAE in art education and a MAT in museum education. She not only loves learning about art but sharing her knowledge. Sharing has created many opportunities as she has taught in many communities in the US. The most recent ,18 years at Colorado Academy. Although she misses the children she worked with she hopes she carries on their joy of visual creation in her own work. Carole also loves traveling and looking around her own neighborhood. Her love of discovery is often reflected in the emotional response of her artwork. 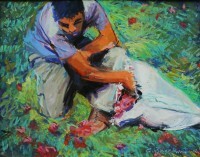 Her work can be found in private collections in Colorado and in Europe and Central America.